Photo copyright 2019 Auto Imagery, Inc.
GAINESVILLE, Fla. -- Megan Meyer (top Alcohol Dragster), Sean Bellemeur (Top Alcohol Funny Car) and Drew Skillman (Factory Stock Showdown)won on Sunday. 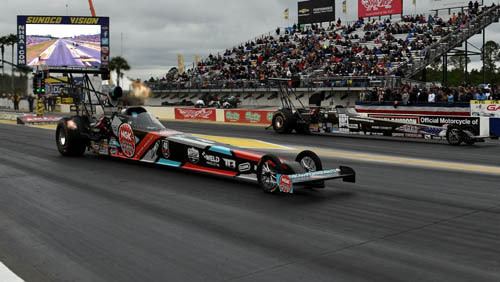 The forecast for Sunday was calling for rain so the NHRA officials decided to finish most of the Lucas Oil Drag Racing Series categories on Saturday. 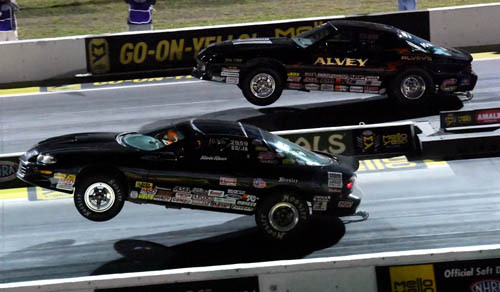 Craig Bourgeois (Comp Eliminator), Kevin Riner (Super Stock), Randi Lyn Shipp (Stock), Holden Laris (Super Comp), Ed Richardson (Super Gas), Doug Ramsey (Super Street), Anthony Bertozzi (Top Dragster) and Sandy Wilkins (Top Sportsman) win the 5oth annual Amalie Motor Oil Gatornationals. 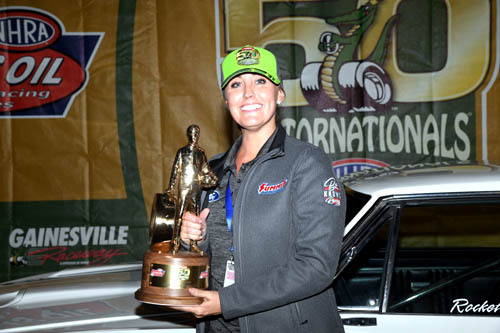 Megan Meyer defeated Mike Bucher in the final round for her sixth National event win and her first at the Gatornationals. 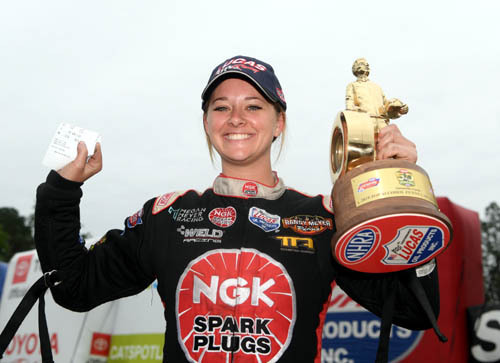 She ran her career fastest pass and the second fastest in the history of the Top Alcohol Dragster category in the final. She qualified number two and defeated Ken Perry in round one. In round two and the semifinal she ran identical E.T.s of 5.177 second to defeat Julie Nataas and Jeff Veale. 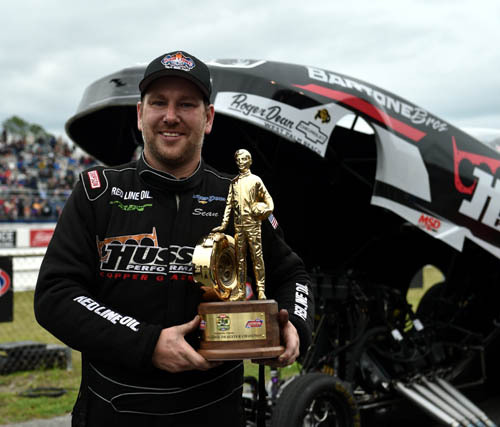 Bucher was only the fourth driver in Alcohol Dragster to qualify in the number 16 spot and advance to the final. He defeat number one qualifier Shawn Cowie in round one. In round two he defeated Josh Hart and Duane shields in the semifinal to advance to his first final round. Sean Bellemeur celebrates his 12th win. 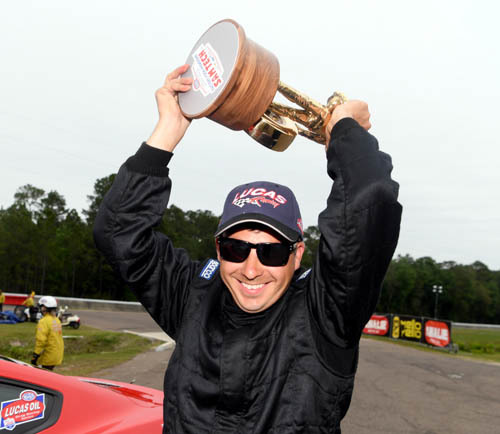 Sean Bellemeur ran the quickest pass in the history of Top Alcohol Funny Car in the final to defeat Doug Gordon. Bellemeur qualified in the number three position and beat Ryan Stack in round one. In round two he ran low E.T. of the event to defeat Nick Januik. 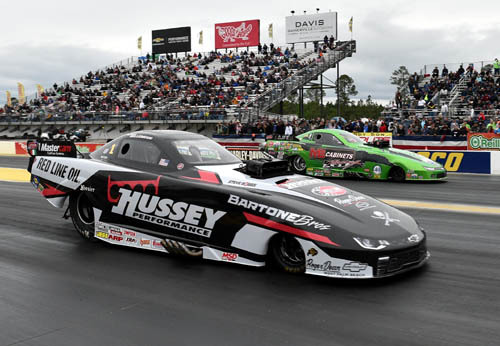 In semifinal he defeated Brian Hough in a great side-by-side race with the fourth quickest pass in the history of Top Alcohol Funny Car. Doug Gordon qualified in the number five position with a 5.460 second pass at 271.79 mph. Gordon beat Aryan Rochon, Annie Whiteley and Dan Pomponio to advance to his 27th final round and second this season. Drew Skillman celebrates his first Factory Stock win. 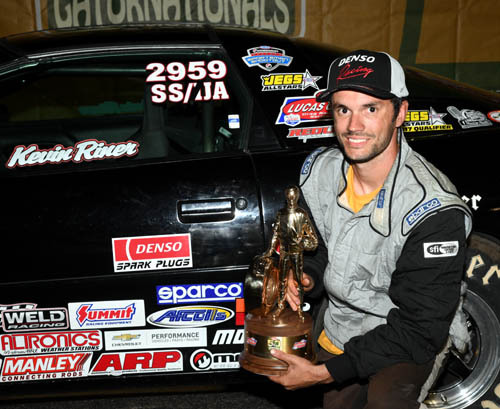 Drew Skillman won SAM Tech Factory Showdown trophy defeating Stephen Bell in the final. This was Skillman's first race in the Factory Stock category after retiring from Pro Stock. 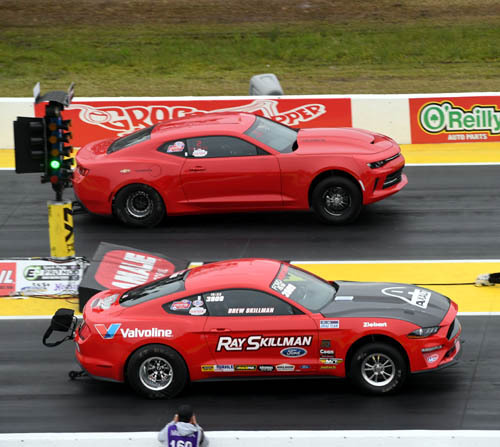 He qualified his 2018 Mustang fifth with a 7.829 second pass at 175.11 mph in the quickest field in the history of Factory Stock. He defeated Leonard Libersher in round one and his father Bill Skillman in round two. In the semifinal he ran the quickest pass in the history of Factory Stock to defeat Randy Taylor. Bell qualified eighth in his 2018 Camaro and defeated Pete Gasko Jr. in round one. He beat Ryan Priddy in round two and Carl Tasca in the semifinal to advance to his Factory Stock final. Craig Bourgeois celebrates ninth win. Craig Bourgeois qualified his A/ND dragster in the number 10 spot with a 6.842 second pass, 0.588 under the 7.43 index. He defeated Gary Wolkwitz, Jim Kimbrough, and David Rampy in first three rounds. He got the bye in the semifinal to advance to his 12th final round. In the final he had a perfect reaction time and the hole-shot win over Randy Daniels in the final. Bourgeois won his ninth National event Wally. Kevin Riner celebrates his first win. Kevin Riner qualified his SS/JA '98 Chevy Camaro in the number 42 spot with a 10.371 pass, 0.629 under the 11.00 second index. He defeated David Janac, Ed Longhany Sr., Jason Stoll, Anthony Bertozzi and Steve Comella in the first five rounds. 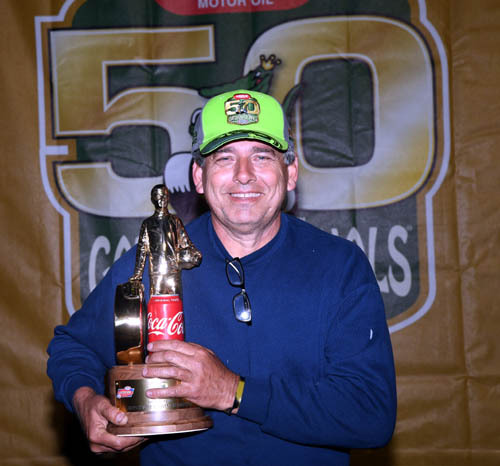 Mark Alvey had a tick advantage on the starting line and then took too much stripe to give Kevin Riner the Super Stock trophy. 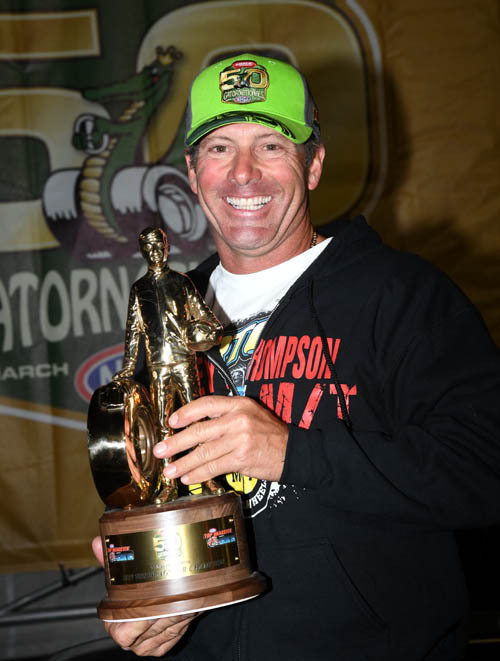 Riner won his first National event Wally in his first final round. Randi Lyn Shipp defeated Eddie Longhany Jr.
Randi Lyn Shipp celebrates her sixth win. Randi Lyn Shipp qualified her D/SA '67 Pontiac Firebird in the number five spot with a 0.950 under the 11.55 index pass of 10.600 seconds. She defeated Karl Martel, Dan Fletcher, Brandon Bakies, Jim Roberts and Slate Cummings in the first five rounds. Shipp with the starting line advantage and defeated Eddie Longhany Jr. in the final. Shipp won her sixth career Wally. Holden Laris celebrates his third win. Holden Laris won his first Wally in Super Comp and third overall defeating Nichole Stephenson in the final. He defeated Jeff Mize, Don Higgins, Sherman Adcock, Robert Houston and John Labbous Jr. in the first five rounds. Ed Richardson celebrates his sixth win. Richardson defeated Len Riotto, John Taylor, Ray Connolly, Iggie Boicesco and Ray Miller III on his way to the final. Carl Watts in his '89 Chevy Cavalier had a few tick advantage on the tree, but took too much stripe to Richardson the win. 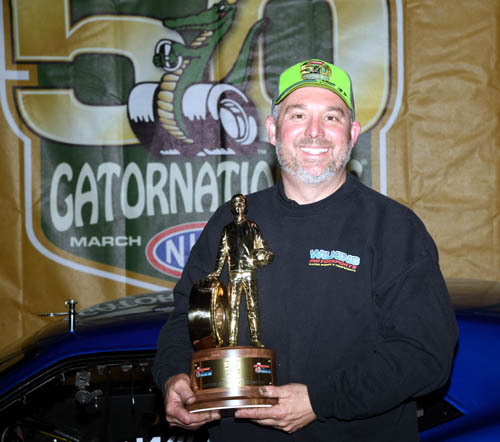 He took his '63 Chevy Corvette to the winner circle for the third time in Super Gas and he now has six overall wins. Ramsey defeated Eddie Brooks, Lamar Stevenson, Ed Pauley and Robbie Welch in the first four rounds. He got a bye into his first Nation event final round. In the final he had a great light (0.005) and great package (0.010) to defeat Colby Fuller, who was also in his first final round. 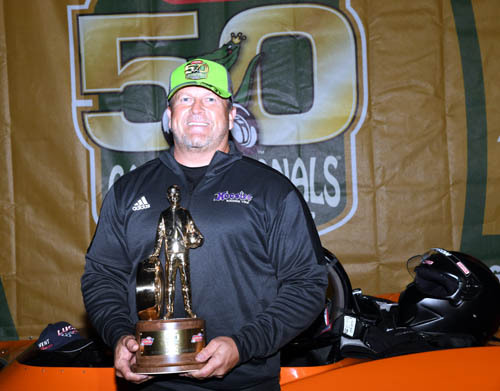 Anthony Bertozzi celebrates fifth win in Top Dragster. Anthony Bertozzi qualified 11th in Top Dragster presented by RacingRVs.com with a 6.233 second pass at 218.72 mph. He defeated Becki Miller, Mario Boesch, William Brown III and Carson Brown in the first four rounds. In the final Bertozzi, got the win when Steve Furr was little too quick on the tree and turned on the red light (-0.005). 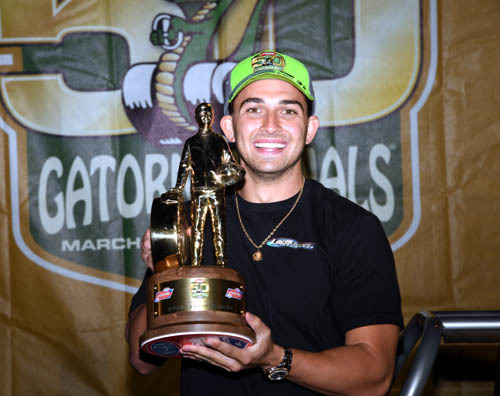 Bertozzi won his 22nd National event Wally and second in Gainesville. 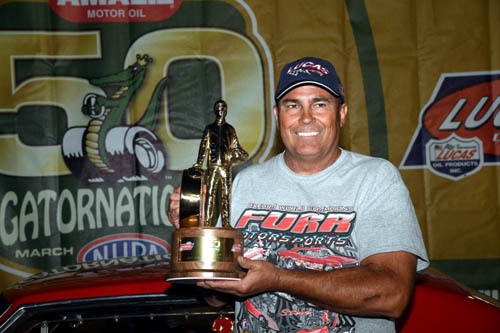 Sandy Wilkins celebrates his third National event Wally. Sandy Wilkins qualified his '69 Camaro in the number 10 position with a 6.682 second pass at 204.66 mph. He defeated Javier Matos Ruiz, Allen Firestone, Dennis Dowson and Ronnie Proctor in the first four rounds of eliminations. 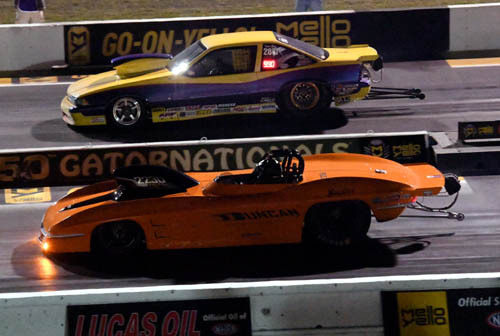 Wilkins had a 0.020 light in the final and a great package of 0.025 seconds for the win over Bruce Thrift in his Pontiac GTO. Wilkins won his third National event.